Sizes ranging from 0 - 26W. Large selection of designs--from simple and sleek to the full ball gown. 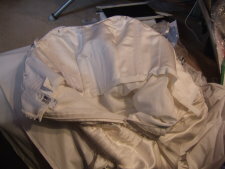 Fabrics of all types--- satin, taffeta, chiffon and tulle fabrics. If you are looking for simple dresses-- there are styles with no beading to just a touch of beading. You can get fabric swatches for your gown and bridesmaids gowns. They offer their brides the option to order extra length if needed. You can add additional length to the train. They don't charge extra for plus sizes. You can also order extra fabric to add details to your gown. You can order a catalog directly from their website. Quick Ship dresses in 4 weeks for specific styles. You can order their gowns from local bridal shops, online wedding dress shops or visit one of their Alfred Angelo flagship stores near you. The Disney's Fairy Tale wedding gowns are designed to reflect the style of Disney's iconic princesses. If you truly want the princess bride, fairy tale wedding dress look... you have to check out these gowns! The Hint of Hue collection has an array of gowns in various shades of color. There are a couple of floral print wedding gowns great for a garden theme wedding setting. The mix and match separates gives you the opportunity to create your own look. There are several tops and about 5 skirts to pair them with. 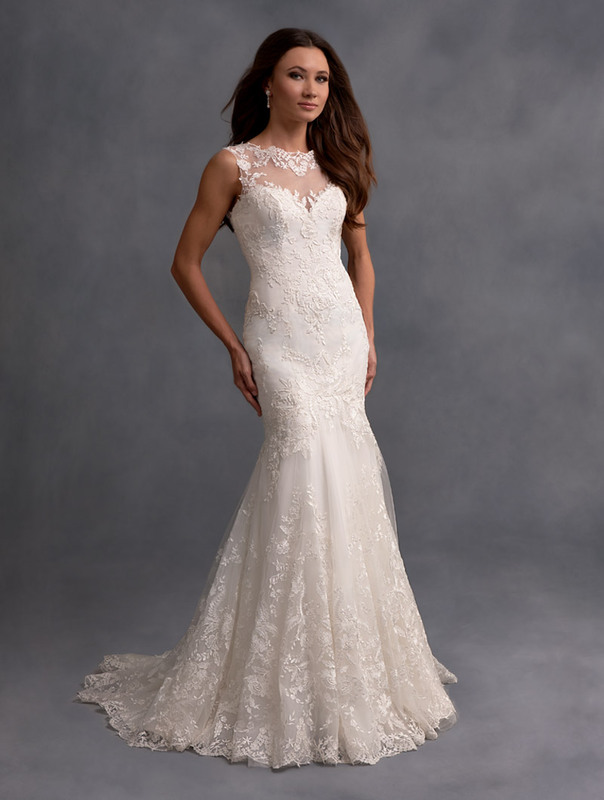 Sheath wedding dresses are hard to find, but Alfred Angelo has 3 styles you can choose from. Look in there silhouette collection. Based on my alteration experiences... when it comes to the construction, fabrics and beading... their gowns are of good quality, made well and are generally a good value for the price, suitable for today's budget conscious bride. You can take a look at Alfred Angelo wedding dresses on their website, and see for yourself the various styles available. You will most likely find your perfect wedding dress! "When it comes to Alfred Angelo wedding gowns--here (in the above picture) is an example of the inner construction of one of their gowns. This particular style has an inner bustier. This helps a bride feel comfortable and secure when wearing a strapless wedding dress." Once you visit the Alfred Angelo website you will no doubt find something you like. But where can you buy the dress you selected? You can check your local bridal store to see if they carry it. If you know the style number you can purchase the dress online. 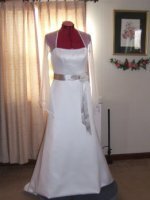 One place I feel completely comfortable with is BestBridalPrices.com. Read my review.